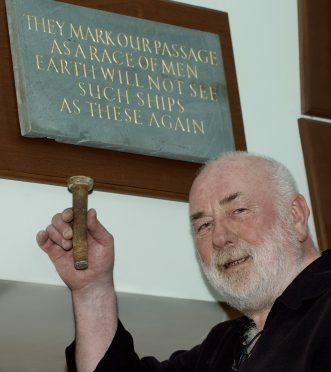 First piece of the tea clipper "Cutty Sark" to come back home to Inverbervie and Scotland, an original bolt from the hull is proudly held by Dave Ramsay in the Burgh Hall Inverbervie beside the Hercules Linton Memorial. Mearns Heritage Service founder Dave Ramsay has been awarded the British Empire Medal for services to heritage, special needs education and charity in Kincardineshire. Last night Mr Ramsay said: “It was a real surprise – it’s brilliant. Praised for his work with north-east schools and his three documentaries about Robert Burns’s father, Mr Ramsay has also successfully had three heritage plaques installed in the Mearns area for Joan Eardley, Hercules Linton and Adam Christie. Mr Ramsay helped open the Maggie Law Museum in Gourdon and has also led school projects on the centenary of the Bella – the fishing boat whose crew was taken prisoners of war whilst out fishing off the Catterline coast and the Cutty Sark. Mr Ramsay said he did not expect to get any recognition for his efforts in the community but wanted to thank the “unknown person” who had nominated him.